For experienced orthodontic treatment and care, you can never go wrong with Dr. Thomas A. Giegerich. A skilled orthodontist, Dr. Giegerich specializes in treatment for kids, teens and adults. His vast experience and unique, one-patient-at-a-time treatment style have made him the preferred orthodontic choice for over 7,000 patients. It was meant to be when I walked into your office and inquired about fixing my teeth. You were warm, helpful, and professional from day one. I want to extend my sincerest gratitude for treating me and making my smile beautiful! I know you cared about me and I felt like part of the family. 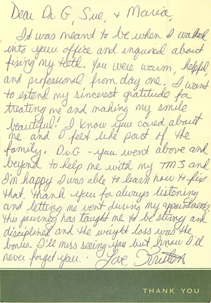 Dr. G – you went above and beyond to help me with my TMJ and I’m happy I was able to learn how to fix that. Thank you for always listening and letting me vent during my appointments. This journey has taught me to be strong and disciplined and the weight loss was the bonus. I’ll miss seeing you but know I’ll never forget you. 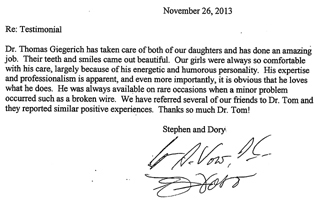 Dr. Thomas Giegerich has taken care of both of our daughters and has done an amazing job. Their teeth and smiles came out beautiful. Our girls were always so comfortable with his care, largely because of his energetic and humorous personality. His expertise and professionalism is apparent, and even more importantly, it is obvious that he loves what he does. He was always available on rare occasions when a minor problem they reported similar positive experiences. Thanks so much Dr. Tom! I brought my 8-year-old daughter in for a consultation and as immediately impressed wih the office and extremely friendly and welcoming staff. My daughter's front teeth were protruding outward and she could not close her lips because her teeth were in the way. Aside from the esthetics, we were concerned that she would break her front teeth playing sports. Move ahead 9 months, braces come off, a beautiful smile and a very happy child emerged. 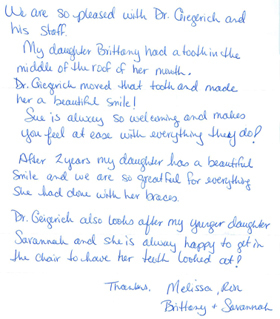 Dr. Giegerich has such a wonderful personality that my daughter was very comfortable and excited to go to every appointment. I couldn’t be happier. I would recommend Dr. Giegerich to anyone thinking of getting braces. I became a patient of Dr. Giegerich in August of 2011. I had full braces around 1962 (high school) and over the years the teeth shifted. Again I had full braces in my late forties. Fast forward I am now let’s say “retired” and had some dental work done which caused my bottom teeth to shift/cross badly. At this stage of the game I was not sure what to do but was referred to Dr. Giegerich and that was a god send. My bottom teeth were very difficult to get in line but Dr. Giegerich never gave up and tried every trick in his book and I am happy to say that my bottom teeth are perfectly straight and have stayed that way. I still go for my visits to make sure they are in line. From the moment that I entered the office back in 2011, Sue, his assistant and Dr. Giegerich made me feel so comfortable and I knew I was at the right place. They are professional, friendly and make you feel right at home. For more it was so wonderful that Dr. Giegerich was more than willing to work out a payment plan for me since I was retired and living on a limited income. IF YOU WANT IT DONE RIGHT AND HAVE FUN IN THE PROCESS THEN GO SEE DR. GIEGERICH AND SUE!! My daughter’s smile was an ugly duckling and Dr Giegerich transformed it into a beautiful swan!! 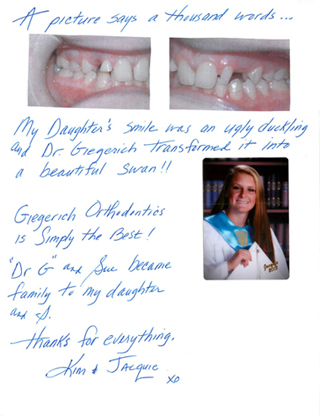 Giegerich Orthodontics is simply the best! Dr. G and Sue became family to my daughter and I. 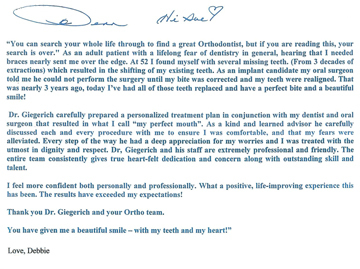 We are so pleased with Dr. Giegerich and staff. My daughter Brittany had a tooth in the middle of the roof of her mouth. Dr. Giegerich moved that tooth and made her a beautiful smile! Sue is always so welcoming and makes you feel at ease with everything they do! After 2 years my daughter has a beautiful smile and we are so grateful for everything she had done with her braces. Dr. Giegerich also looks after my younger daughter Savannah and she is always happy to get in the chair to have her teeth looked at! When I had my first evaluation with Dr. Giegerich, I had been suffering from migraines for a couple years. By the time I left the appointment, I had a bite appliance to wear and one was custom ordered for daily use. Within three days, my headaches were improved, and with the custom appliance, they even got better. He reshaped my bite, which relieved the muscle spasms in my face and head. He did what other doctors could not do because of his advanced training, insight, and expertise. He’s kind, flexible, compassionate and a perfect gentleman. Thanks for giving me my health back, Dr, G.! You’re awesome! “You can search your whole life through to find a great Orthodontist, but if you are reading this, your search is over.” As an adult patient with a lifelong fear of dentistry in general, hearing that I needed braces nearly sent me over the edge. At 52 I found myself with several missing teeth. (From 3 decades of extractions) which resulted in the shifting of my existing teeth. As an implant candidate my oral surgeon told me he could not perform the surgery until my bite was corrected and my teeth were realigned. That was nearly 3 years ago, today I’ve had all of those teeth replaced and have a perfect bite and a beautiful smile! Dr. Giegerich carefully prepared a personalized treatment plan in conjunction with my dentist and oral surgeon that resulted in what I call “m y perfect mouth” As a kind and learned advisor he carefully discussed each and every procedure with me to ensure I was comfortable, and that my fears were alleviated. Every step of the way he had a deep appreciation for my worries and I was treated with the utmost in dignity and respect. Dr. Giegerich and his staff are extremely professional and friendly. The entire team consistently gives true heart-felt dedication and concern along with outstanding skill and talent. I am a 37-year-old woman who always loved to smile but was never happy with my teeth, They were crooked and out of place, I was looking for a dentist to get braces, but other dentists wanted too much money for adult braces. So I came to see Dr. Giegerich, I knew from the moment I met him that he would help me. He was so kind and understanding, He listened to me and told me how he could make my teeth beautiful. Dr. Giegerich and his assistant Sue were so friendly and knowledgeable they made the process so easy! I now have the beautiful smile that I have always dreamed of! 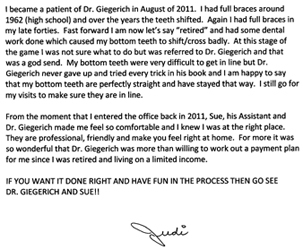 I would highly recommend Dr. Giegerich to anyone who is not happy with his or her teeth. Set sail for the best smile you and your child can have. Call Giegerich Orthodontics at 609.652.1900 or fill out our online Request an Appointment form to schedule a complimentary consultation with Dr. Thomas A. Giegerich. Atlantic County, NJ residents visit us from Egg Harbor City, Galloway, Smithville, Absecon and Brigantine, near Stockton College and near Atlantic Mainland Hospital.